Well the powers above have finally gotten their act together, and in the next 4 to 6 months we will be switching to Glock 19s. I am trying to find a holster that will work with the TLR7 light I will be buying to go with the gun. Kydex, and I want the thing to be super tight. I want a positive, hard snap in and out, and it should take great effort for the gun to come out. While I don't plan on doing intentional back flips with it ( ), I want the gun to stay put until I'm damn sure I want it out. Running, jumping, fighting, with the gun holstered are a great concern. Clearing the holster is not a finesse move IMO, so I only want the gun to come out if I'm yanking on it like I'm starting a stubborn lawn mower. Most holsters are horrible when it comes to this, especially with a light. 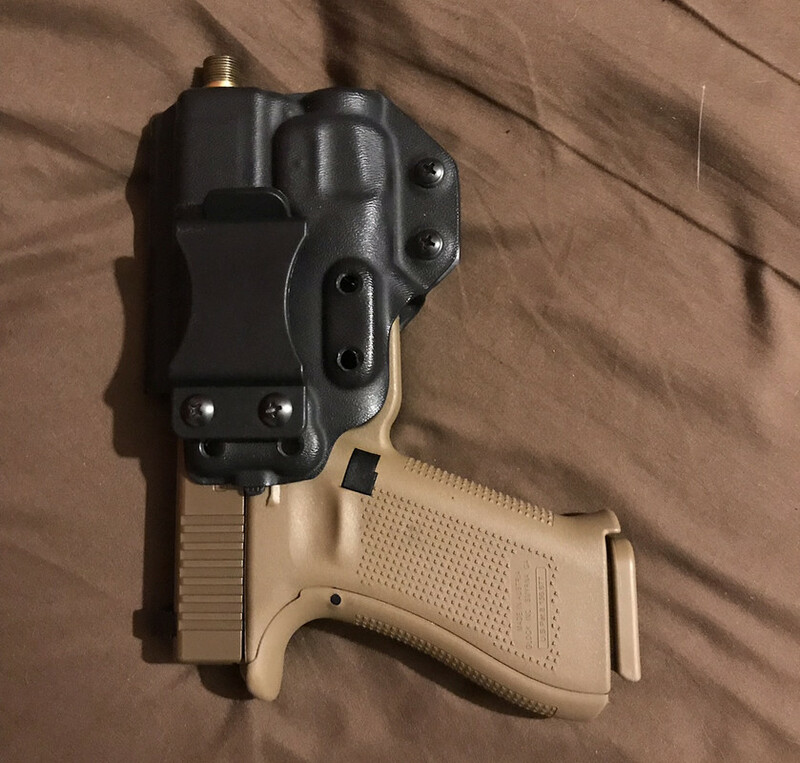 Ideally it would be a "taco" shaped holster with two tension screws, along the opening of the "taco" at the back of the holster, so when tightening it down, even pressure can be applied to the gun. 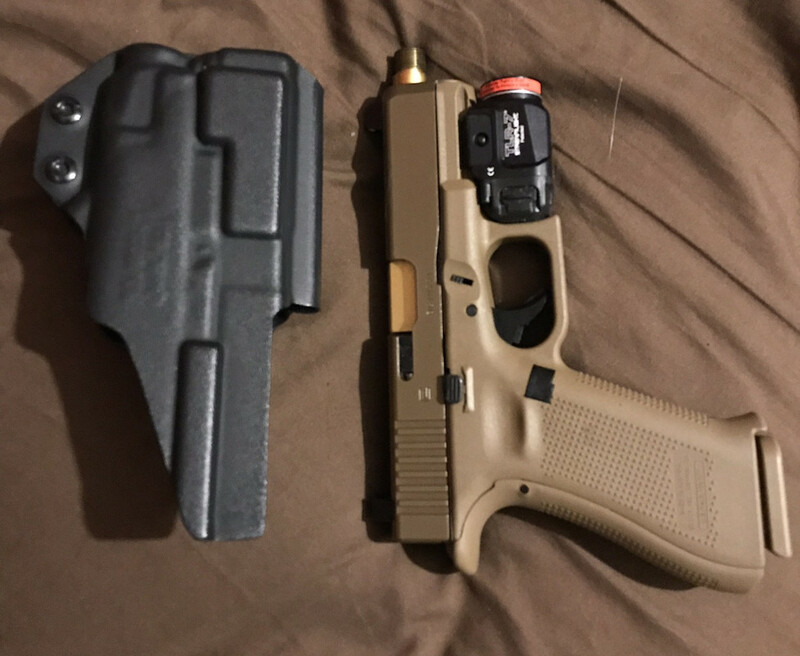 It would be nice if I could get cloth covered kydex, similar to a G-Code, so I could have a bright color kydex, covered with black or grey cloth. I like being able to clearly see if anything has inadvertently gotten inside the holster, before shoving the gun back in there. Preferably it should have soft loops, without snaps, or easily adaptable to that setup. Straight drop, or a very slight "FBI" cant, are preferred. My current IWB holsters, won't meet the above needs/wants, with the TLR7. So I'm fishing for suggestions. Not sure if it meets all your requirements, but I have 3 of these for my G19 - no light, X300, and XC1. Probably falls just a tad short of your 'super tight' requirement (but they are very secure IMO), but they are great with custom requests and could probably make sure that happens for you. Thanks, I'll give them a call and see what they can do. I’m using a Werkz M5? I forgot the exact model. I removed the wedge appendix addition and just use it at 3/4 oclock. I will see if I can tighten the tension and shake the thing upside down and see if my gun falls out. I’m using a 32 with TLR-7. I think they had different clip options. JM Custom Kydex may work for you. If you don't find what you want on the online store, just email them. Thank you both, I will check them out too.